Winter has arrived! During the week we had some longed-for rain and on that day, the top temperature was only 13 degrees. Let's not become over-excited though, the rain gauge measured only 14 ml, but we were very grateful. Nothing refreshes the garden like the water that comes from the sky, and the recent rainfall means I won't have to water the garden beds for some time. 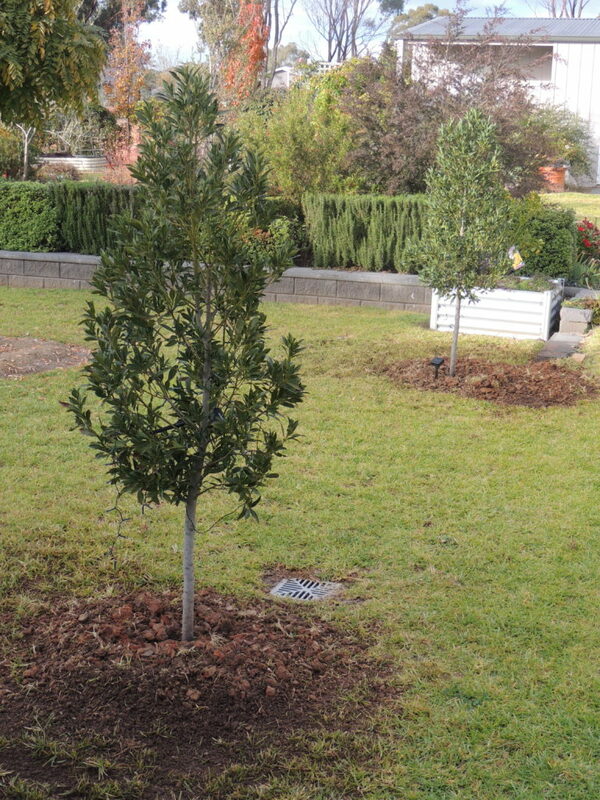 A well mulched garden will stay damp for a while when the daily maximums are so much lower. Six on Saturday is the forum where gardeners share six things from their garden with other enthusiasts from all over the world. If you would like to see what other people have growing, do pay a visit to the Propagator to find out. 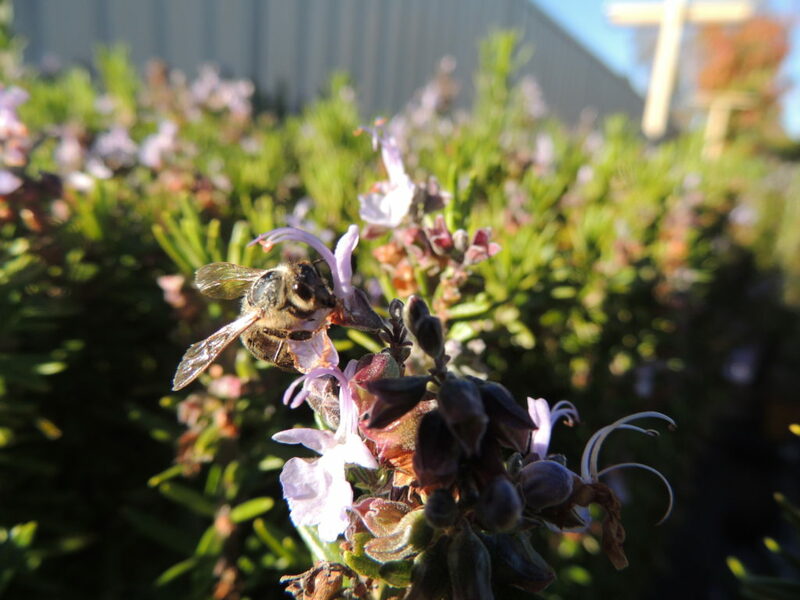 One: The rosemary hedge has been needing a trim for a long time, but it has been flowering for about two months and the bees love the flowers. Each day the hedge is full of a variety of humming bees going about their business while the hedge grows more spiky and disreputable. Rosmarinus officianalis 'Tuscan Blue' is the rosemary I use for my hedge because of its upright growth habit: it has a much stronger colour than this early morning photo shows. Two: Bay trees. Despite warnings from a couple of concerned sixers, Mr MG (Trevor) and I went ahead and released the two bay trees from their imprisonment. The hole-digging exercise was tiring in the extreme as although the ground had been dampened, it was still of a concrete consistency, requiring a crowbar and back breaking stints on the business end of the shovel. The plan is to keep these bays trimmed and not too tall. I may live to regret this decision. Time will tell. Three: Iris cretensis 'Starkers Pink' purchased from Lambley Nursery has its first flower. I have to confess that I'm a little disappointed with the slightly pallid colour, but if it has quite a few flowers out at once (when it gets a bit more established), I'm prepared to forgive it. It's supposed to a very hardy plant that can deal with extended dry periods. You wouldn't think so to look at that dainty flower, would you? Four: Viola tricolor also known as Johnny Jump Up, amongst other names. 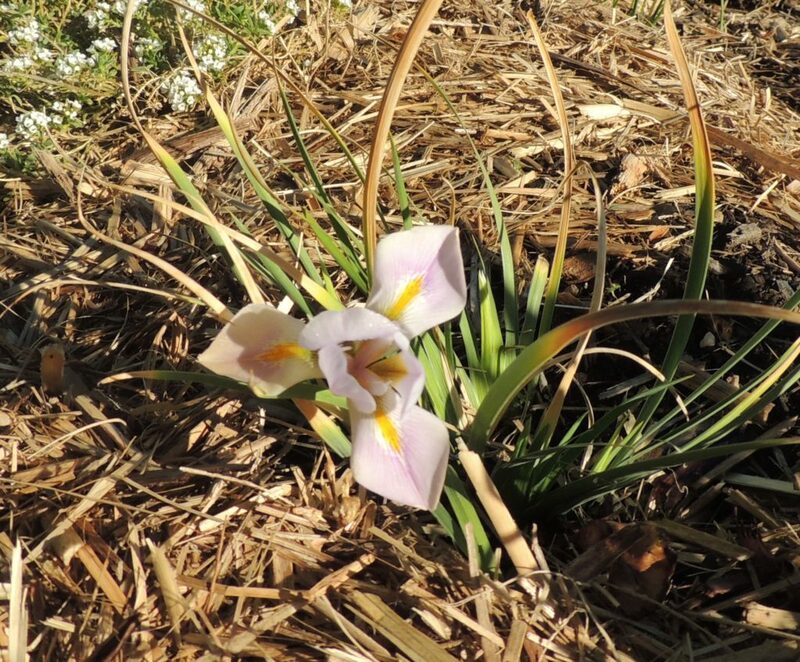 There are little seedlings emerging in many places in the garden, but this is the first flower to appear. Soon these will be flowering everywhere and will make a splash of colour during the wintry days. I think I should call this one another unsung hero. 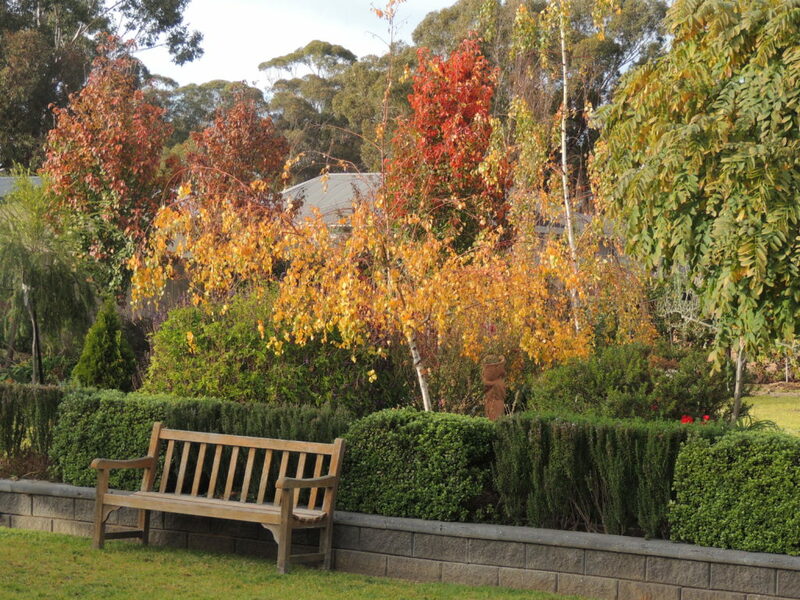 Five: A garden view with the last of the Autumn leaves. The weeping silver birch behind the seat was attacked by borer early in its life. It lost a leading branch on a very windy day, and has refused to grow any taller. It’s a striking colour just now, but may be living on borrowed time. Six: Two Eastern (white cheeked ) Rosellas have found the last of the seeds on the Crepe Myrtle. It's such a privilege to have these colourful birds visiting the garden, and I never tire of seeing them. The outcrops in the photo at the top of this post are quite typical of rock formations around our local area. 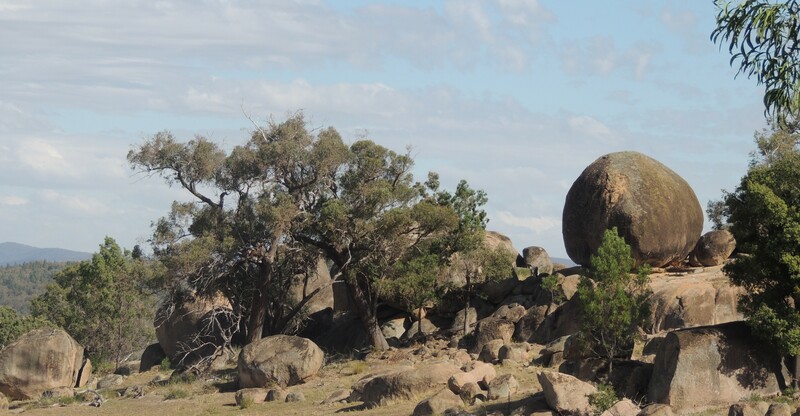 Large, smooth boulders, some of them quite monolithic, jut out in paddocks and create lumbering shadows and intriguing shapes. You can see how dry it's been- there should be green grass where that grey ground is. Weather today: 1 degree to 16 degrees C; frost and then cloudy. My Rosemary’s flowering also. And more importantly, now the Harlequin Bugs have ‘flown north’ for the winter, the flowers might actually have a chance of growing. Johnny Jump Ups are such a joy at this time of year. Hope you get some more rain soon. We have a clear week at the moment, but I’m housebound still, so can’t get out to enjoy it. No more rain in sight for us, Vicki. Hope you can get out and about soon. Thanks Derrick. We’ll keep a look out. The rock photo was taken a few km outside the town of Mudgee. We have a lot of rocks like that around here. Your description of the soil sound back breaking, it makes me glad for our sandy soils here.it is nice to read about gardening from other locations. Beautiful birds! Thanks, Victoria. Yes, we could certainly do with a bit of sand here- we have a lot of clay. We haven’t had any rain now for weeks. It’s so dry. Is there a trick to getting your violas to self sow like that? I would love to have them popping up in my rose garden. There’s no trick to Johnny Jump Up who self seeds willingly. I planted a punnet last summer and now they’re popping up everywhere. I think they’d be very suitable around roses. I know what a fan you are of Autumn colour, Pauline! It will soon be over and the garden will be looking drab for a while. Nice and warm up your way! Your garden is looking so beautiful, Jane. It is a welcome relief to me given my other WP voluntary work. It must be so lovely to have the birds and the bees visit. Hopefully more rain is on the way. Thanks Tracy. No rain in the near future, I’m afraid- probably the same for you. I didn’t know there was voluntary work associated with WP. Beautiful birds. Our most colourful ones are Goldfinches and I am pleased to see them back in the garden. Love the idea of a rosemary hedge! Hi Jude, the rosemary hedge is a really good doer..pest free, hardy and not too rampageous. I think it’s going to be a challenge soon, to find six things of interest, but no more so than anyone else during winter, I expect. Thanks for the rain wishes, Gill. Wow, I’m in Provence, France, and it is quite amazing to think of it being autumn there. We are just getting rid of winter, having had the wettest spring I can recall. Those parrotty birds! Um, we don’t have those here…… they are spectacular. Enjoying seeing what its like on the other side of the world. Hello! I enjoy seeing gardens in the northern hemisphere too, and they’re looking pretty stunning with their surging growth after all the rain. Rosellas! How lovely. Also it’s nice to see autumn colour whilst it is still summer here!! Colourful in both hemispheres, June! I never get over my amazement at how colorful the birds in your part of the world are! With the exception of our blue scrub jays and our (male) hummingbirds, most of our local birds look downright shabby by comparison. The orchid tolerant of extended dry periods is a great find. Hello Kris, I think humming birds must be rather special. It’s actually an iris which makes it not quite so special, although it was a limit of one per customer, which between you and me, is really why I bought it! It will probably make more of a show when I can divide it and spread it around the garden. Starkers pink! That made me smile. I assume starkers has the same meaning down under as it does here? Although not commonly used, yes, starkers has the same meaning here. Adds another dimension to the iris, doesn’t it! 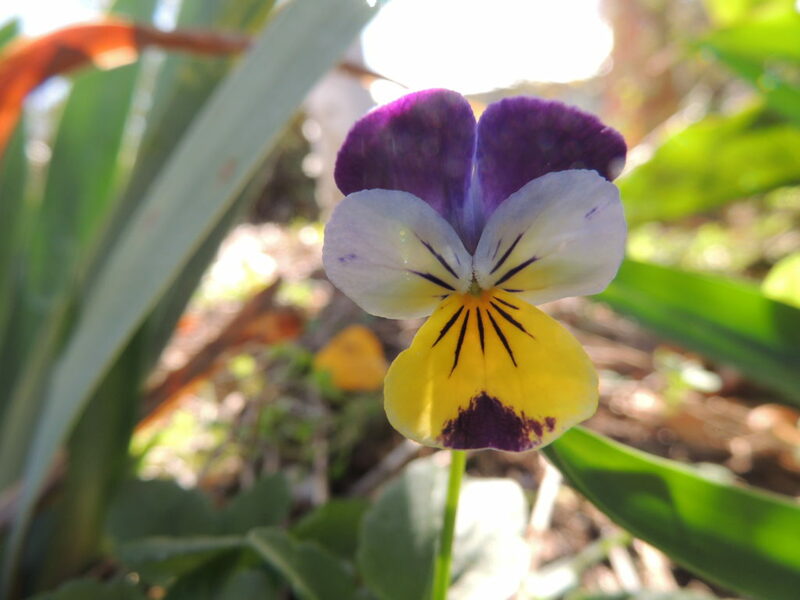 I’m amazed that Viola tricolor self sows with you. It does the same with me in Cornwall. That’s a versatile plant. 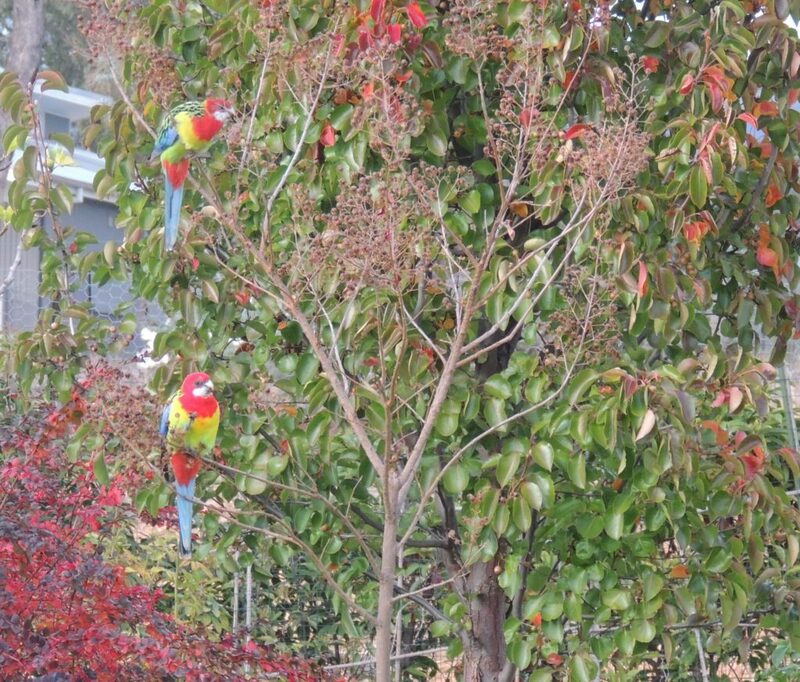 Are the Rosellas as noisy as Lorikeets? They’re beastly at four in the morning. I don’t think Rosellas are as noisy as Rainbow Lorikeets. Lorikeets have bred rapidly in Sydney and the noise is deafening when they descend upon Port Jackson figs in the evening. I’ve only heard our Rosellas make sweet sounds, but then we don’t have armies of them. Winter hasn’t got into full stride yet, Fred. July and August are our coldest months. Last July we had many mornings of around -6! Soon the lawn will be brown. Those birds are beautiful. I bet a few of the Six-on-Saturday crowd in this country had a smile when they read that winter had arrived at your garden. It’s difficult to imagine the cold weather when the sun is shining, just as it is difficult to imagine the sunny weather when outside it is cold and gloomy! Interesting Six, again. Thank you. I’m remembering sixes when I first joined and tales of cold damp gardens, frost and snow. That will be me soon, without the damp and snow! Lack of rain is always a problem for gardeners, so moaning is definitely allowed! in your first photo is intriguing – the rock formations. A rosemary hedge – that must be beautiful! They aren’t hardy in this area, but they have an attractive structure and color. Do you catch the scent of rosemary from the hedge? The smell is noticeable when the hedge is cut. The hedge isn’t particularly beautiful except that the flowers are wonderful for the bees, and it is very hardy. A lovely six once again, Jane! The rain must be such a relief at long last, I can sense just how dry everything is through your words – bit hard to imagine when we have had torrential rain this week and everything is intensely green here. Love the Johnny Jump Up (I know it as heartsease) and those rosellas are so beautiful, do they stay all year round? The rosellas are only visitors to the garden,Lis, but they can be seen quite often around here where there are trees and fruits to interest them. I thought the top photo was a painting, Jane – it is beautiful. I love Eastern rosellas. Do they visit year-round? Yes, the rosellas can visit at any time: there’s a crimson rosella, much more dashing, but seen less often. I like those rocks too, would like to clamber around them but they’re on private property. I would love to know how the sphere got to be so perfectly shaped. The Rosellas are a real pop of colour, enough to compete with the great autumn colour from your trees. ‘Pop of colour’ is such a great description, Christina. Looks like you live in a beautiful but challenging area! I love those Rosellas, wish we had something like it around here. It can be callenging, Jason, when we don’t have enough rain, or extremely high temps in the summer, which does seem to happen quite often. Otherwise, we can grow nearly everything here.